Engineered bamboo flooring and engineered wood flooring are composite products made up of several layers, the upper layer or “wear layer” of which is either bamboo or real hardwood. The other layers may be plywood, hardwood, or high-density fiberboard. Thesde layers are glued together, often in a cross-grain configuration, to minimize sensitivity to changes in humidity. But which of them has the edge? Here we provide you with a detailed comparison of the two flooring options and score the most important features out of ten. So, add up the scores concentrating on what is most important to your home improvement project; it’s the best way to make a decision. Engineered , especially the strand woven variety is made from the hardest natural flooring material you will find – strand woven bamboo. It is considerably harder than the hardest of hardwoods, so it is highly resistant to denting. That doesn’t mean it’s totally indestructible, but it’s dang near close as far as flooring goes. We’ve even seen bamboo flooring used as a flooring surface in home garages – so people park their cars on it! We measure the hardness of wood species by using the Janka scale which we . It is worth reading if you want to understand how some woods are much harder than others. For hardness and resistance to denting, engineered bamboo scores 10 out of 10. As we have already said in the previous paragraph, bamboo is much harder than hardwood so you might expect it to be much harder than engineered hardwood. You would be right in this assumption. The hardness of engineered wood flooring is determined by the top hardwood layer, so it is the same as hardwood and much less resistant to denting than bamboo, on average; It gets just 7 out of 10 for hardness. Speaking of heavy things on wood floors, here is a useful tip on moving an upright piano that doesn’t involve heavy lifting. Most of us take it for granted that the air we breathe in our homes is reasonably pure. However, that is a big mistake. It’s up to ten times more polluted than the air outside. The main culprits are (VOCs) emitted from all the stuff in our homes including building materials, carpets, paints and so forth. These pollutants are potentially damaging to health, so we advise you to keep them to the minimum. Proper ventilation helps as does making good decisions on the materials you use for your home improvement project. 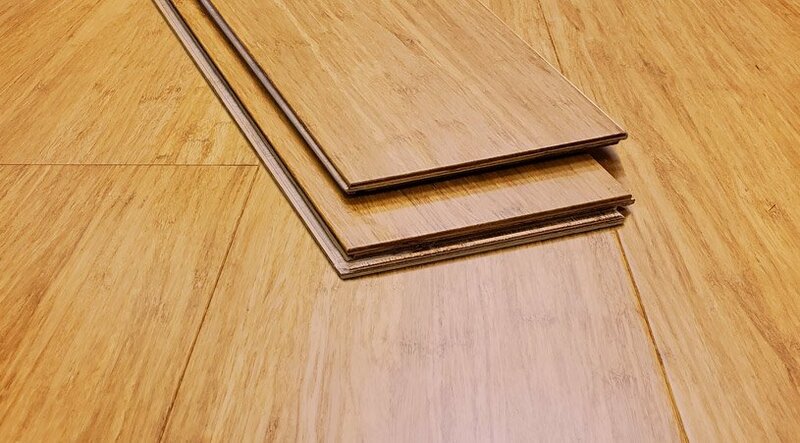 Engineered bamboo flooring produces only a small quantity of VOCs, which comes from the adhesive used in its manufacture to glue the various layers together. However, you don’t need to worry about it as the levels are well below government recommended limits; you can safely install engineered bamboo floors without any risk to your health from VOCs. We give it an indoor air quality rating of 8 out of 10. You don’t need to worry about engineered wood flooring either. Its structure is similar to engineered wood flooring, and it emits similarly low quantities of VOCs. Thus, it also scores 8 out of 10. We doubt if you’re old enough to remember The Hollies take on the air that you breathe – but it is a classic! Kick off your shoes and stretch your toes. What can feel better than walking barefoot on an engineered bamboo floor? We weren’t made to wear shoes. Bamboo floors feel comfortable and warm because bamboo, a grass, has a very low thermal conductivity, so it doesn’t drain the heat away from your feet. Walking barefoot is good for your health too; here are several benefits it offers. Don’t worry; you won’t get any splinters. Additionally, since most engineered bamboo is installed over a 3 in 1 underlayment, you’ll get the added benefit of some cushioning for your back. For comfort for walking engineered bamboo achieves 9 out of 10. Can you tell the difference between walking barefoot on an engineered bamboo floor and an engineered wood floor? If you can, then you must have very sensitive feet. We don’t think there’s much difference, so engineered wood flooring scores 9 out of 10 for comfort for walking too. One of the crucial benefits of engineered bamboo flooring compared with hardwood is that it is more water resistant. This means you can install it in kitchens and other places where it is likely to get wet occasionally. As long as you wipe up any spills reasonably quickly (within 24 hours), you are good to go. 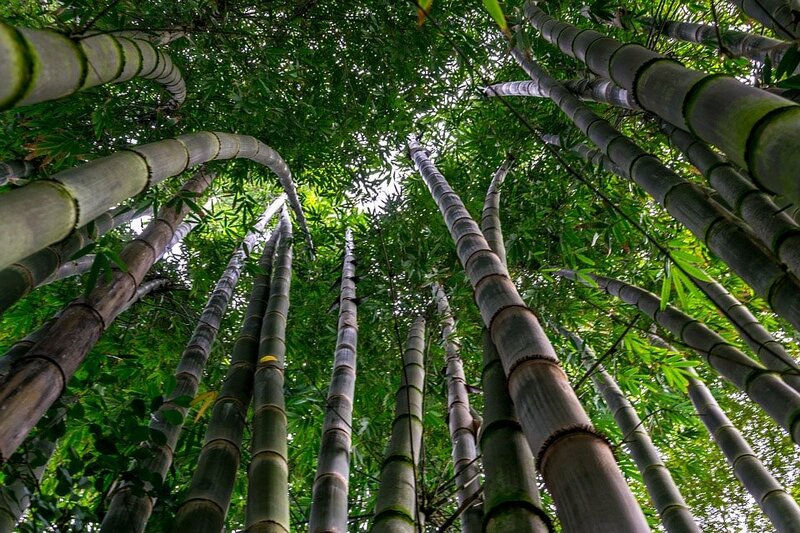 Although water droplets will just dry up, you’ll want to avoid leaving puddles on bamboo for more than 24 hours though, or you’ll risk the bamboo staining and swelling. One reason bamboo is more resistant to water than hardwood is its structure. As it is a grass, it doesn’t have the same kind of porous grain structure as hardwood, so it doesn’t soak up water so quickly. For water resistance, we give it 8 out of 10. Engineered wood flooring is less waterproof than bamboo for the reasons we give in the previous paragraph. It can tolerate a small amount of water, but you should wipe spills up as soon as you can. You don’t have 24 hours grace as you do with bamboo. It’s not the best solution for areas such as your kitchen where you would always worry about damaging it. For water resistance, it scores 7 out of 10. When comparing apples to apples in terms of thickness of the wear layer, engineered bamboo flooring is much cheaper than any comparable (same plank dimensions) wood floor. This is because it is highly sustainable, growing exceptionally quickly and reaching maturity in just five years. It can also regenerate after harvesting, so it doesn’t need re-planting, which prevents soil erosion. It is readily available so don’t worry about encountering any shortages. 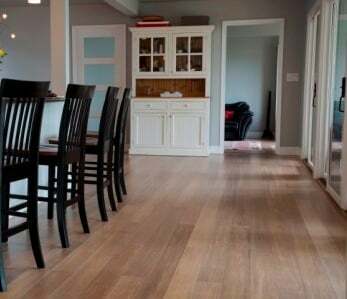 Additionally, engineered strand bamboo flooring rarely if ever needs to be refinished in a residential setting and isn’t scratched by pet claws – as opposed to engineered hardwoods which look all dented up after a few short years – so the life-cycle and long-term value of bamboo is much higher. It scores 9 out of 10 for pricing. 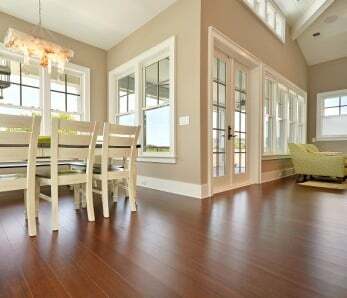 Engineered wood flooring costs considerably more than bamboo; in fact, its costs are similar to those of solid hardwood. The reason is trees take a long time to grow, with most species taking 40 years or more to grow to maturity to be used in flooring. Like bamboo, it is readily available. For pricing, we give engineered wood flooring 6 out of 10. Engineered bamboo flooring is entirely natural. We agree that a little glue and resin is used in its manufacture, but it’s in minuscule quantities and other than that it is 100% natural. As you can’t get more natural than natural. 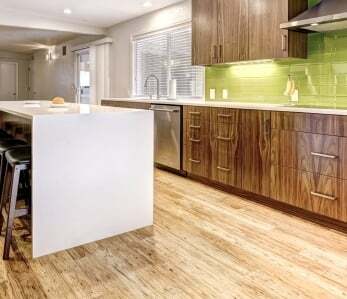 Engineered Bamboo Flooring scores 10 out of 10. Engineered wood flooring has the same some natural credentials; after all, it is made mainly of wood, though a small quantity of glue and resin is used in its manufacture. Engineered hardwood flooring also scores of 10 out of 10. Strand woven engineered bamboo flooring looks and feels very similar to hardwood flooring which is why many people choose it. Its grain pattern has a truly unique marbling effect that looks gorgeous; if anything, bamboo is even more exotic, but see for yourself in the picture below. 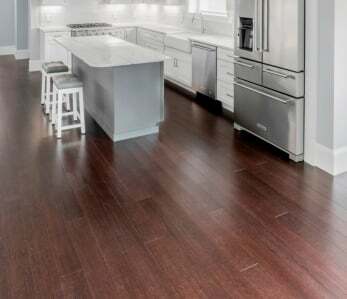 Below is a picture of flooring that demonstrates it’s beautiful color tone and grain. Every plank is unique; you will never find a repeated pattern. For natural variation in the grain, it deserves full marks: 10 out of 10. As the surface of engineered wood is a natural hardwood, it will always exhibit a natural variation. The amount depends on the grain size, growth rings, and knots. Just as with bamboo, every board will have its special character. There is no doubt, a good quality engineered wood floor will always look great; we give it 10 out of 10. Acclimate the wood – let it sit (with boxes cut open to breathe) in your home for around 3-10 days before you install it. This will allow it to adapt to the humidity level and temperature of your home. 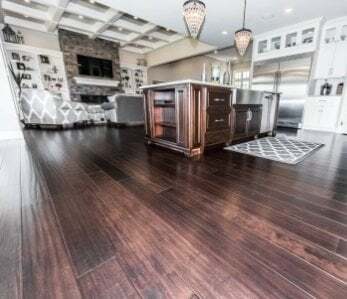 Prepare the subfloor – you can lay the flooring on most clean, dry, level and firm subfloors though if you are installing it on a new concrete floor, you must wait until the concrete has thoroughly dried or use a quality 3 in 1 underlayment. Underlayment is highly recommended, this will even out small bumps and protect the floor from moisture, as well as muffle footfall noise and reduce sound transmission between levels in your home. For ease of installation, both engineered bamboo and engineered hardwood flooring score 10 out of 10. Here is a detailed guide on . or hardwood floor is easy. 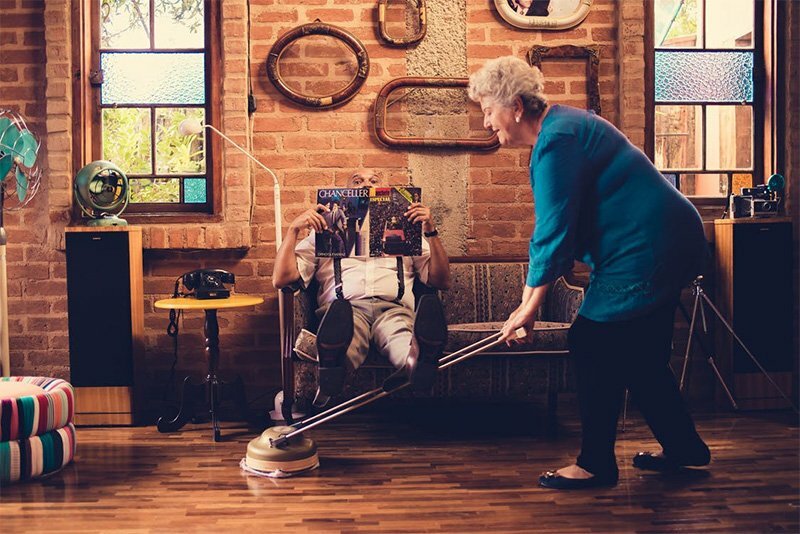 Ideally you’ll vacuum your floor a few times each week, or sweep it using a soft brush broom, and avoid harsh detergents and acidic or alkaline products. Never use wax polish or abrasive materials. You can mop the floor using a lightly damp microfiber mop. But avoid excessive water and dry the floor after mopping. That’s all you need to keep your floor looking great for many years to come. 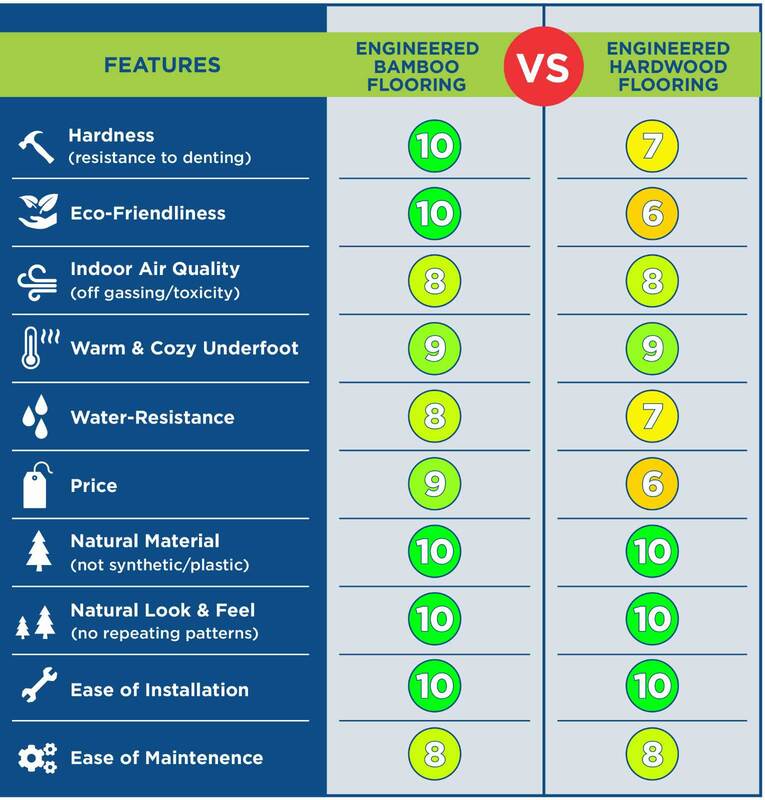 For ease of maintenance both engineered bamboo and engineered hardwood flooring score 8 out of 10. Alternatively, sit back and let somebody else do the work!